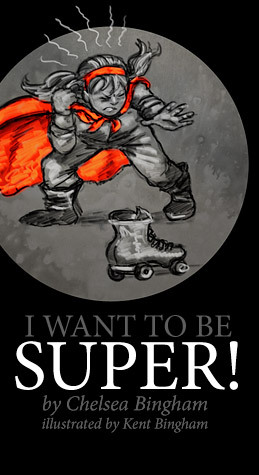 I Want to Be Super! was written by my daughter Chelsea for a college assignment in a Language Arts for Elementary Teachers class at Weber State University in Ogden, Utah. It is Chelsea's first experience writing children's literature and my first time illustrating a children's book. I always thought that someday I would illustrate a children's book, but didn't foresee having less than 24 hours to accomplish it. To meet such an extreme deadline, I had to forego my perfectionist tendencies and work quickly in a rough sketch style. Read it online here or buy the printed version at Amazon.com. Please explore my website which includes a wide range of my work, from professional graphic design projects to loose sketchpad drawings of some odd characters and everything in between. The behind the scenes section takes a look backstage into the design process with a gallery of production concept drawings, including some nice designs that never got used. I've also got linkage to some of my favorite sites on the internet and some interesting odds and ends in my album section. Also, feel free to purchase a poster from my online store.